Usually on the blog I talk DIY, Design, Recipes, and even a little bit about our adoption and life. I never really go “behind the scenes” and talk about the blog itself though. After thinking about it I realized that whenever I talk to someone about our life, the blog is something really intriguing that they always have questions about. SO I decided this year why not share a little bit “Behind the scenes” when it comes to the blog. -So blogging is your JOB?! -So how do you make money blogging? -How do I start a blog? 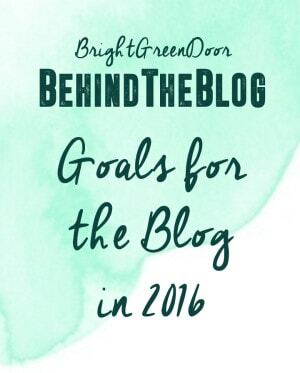 So I am going to start a series: Bright Green Door “Behind the Blog” answering some of these questions. Since it is the first week of January, the week of resolution making and goal setting I’ll start by sharing my goals for the blog in 2016. In the past I have just blogged when inspiration hit, and have never had a schedule or even a routine. This year I’d like to shoot for at least three posts per week. This might mean they’re not all “room reveals”, but sometimes just short posts. This leads me to my next goal..
Often the most successful posts are the big “Room Reveals”, the problem with these is that it doesn’t allow me to share the progress, the DIY’s, or the planning until the room is done. Going forward I want to take you through the process with me. Sort of like how I did for the “one room challenge“. Then after we’ve gone through the process I can share a big Pinterest-worthy “reveal” at the end. Hopefully this opens the door for more input, and shows a bit more real life. I can’t promise I won’t jump from room to room, but I can promise this will help me from missing or not sharing giant parts of the process, like what happened while we finished the Retro Ranch. My blog readers (you guys) are the best. The interaction that comes from comments, instagram, and Facebook are what drive me to create new content and share it. When I share a project my goal is that it inspires a reader to tackle a project, or dig into a room design. The readers I have are the best, the problem is that 90% of my readers are people who come from Pinterest for one specific project or tutorial. They check it out, leave, and never return again. This makes it tempting to just create blog posts that will attract “Pinterest Viewers”. My goal is that I would create a place that readers want to return to again and again and become part of the “Bright Green Door Community”. Because you’re reading this, I want to say “Thank You” for being part of that community! Yes, this little blog actually makes some money! With our recent move and job transition I went from working 15ish hours per week for my parent’s company, to working about 2 hours per week. We also left the luxury of a higher paying oilfield job. This means that I was faced with the decision to leave the blog and go back to work, or to ramp up my blogging with the goal of it bringing in a good income. I love blogging. I love the flexibility of working from home and being here for our family. It was an easy decision to say that I’d like to stay home and continue blogging, the hard part will being taking this blog from earning a small part time income, to earning a full time income. I am hoping to make this leap without having to add too much sponsored content, while remaining true to my love for DIY, design, and great recipes. Taking some online design courses while continuing to do some design work. So there it is, my blogging goals for 2016. In the next “Behind the Blog” I’ll be back to share the answers to some of those questions! What questions do you have about blogging? Thanks for reading and supporting the blog (and our family! Aw thank you friend, I need to pick your brain on a few things! I’m so happy to see people jumping back into blogging more regularly. It’s my goal this year too!